With two starters missing, E.J. Rowland stepped up with a monster game to lead Hapoel Bank Yahav Jerusalem to a 92-90 victory over Krasny Oktyabr Volgograd in the Israeli capital. Rowland starred with 22 points, 7 rebounds and 12 assists for the winners, who staved off overtime when Oktyabr forward JaJuan Johnson missed a dunk attempt at the buzzer. It capped an exciting finish that saw six lead changes and four ties in the final six minutes of action. Matt Janning scored 20 points, while Donta Smith added 16, Tony Gaffney recorded 13 points, 8 rebounds and 2 blocks and D’Or Fischer netted 11 points for the Israeli champs, who were without Lior Eliyahu and Yotam Halperin. D.J. Cooper was brilliant in defeat with 27 points, 13 assists and 3 steals. Dmitry Sokolov, T.J. Guinn and Johnson scored 14 points apiece and Jordan Hamilton had 10. Sokolov added 10 rebounds, Hamilton 9 and Johnson 8. Hamilton put Oktyabr on the scoreboard first with a three-pointer before Josh Duncan and Janning gave the hosts a 5-3 edge. D.J. Cooper dished a pair of assists and drained a three in a 0-7 push for the visitors. Duncan and Smith closed the gap for the hosts and smith tied the score at 13-13 before another Janning triple put Jerusalem ahead. Janning connected twice more from deep, though R.T. Guinn did match him on the second. Viacheslav Zaytsev and Rowland hit free throws to end the first quarter at 26-20. A Gaffney triple extended Jerusalem‘s lead to 9 early in the second quarter. Johnson and Sokolov kept Oktyabr in the game, but a Fischer basket and foul made it 38-28. Cooper scored five quick points and Hamiilton added free throws as the visitors closed to within 3. Gaffney and Smith kept Jerusalem ahead. Rowland scored and then assisted Smith before Johnson drew Oktyabr within 51-44 at the break. Cooper started the second half with a three-pointer and then assisted Johnson and Sokolov as the visitors tied the game. However Oktyabr never took the lead and a 9-0 push that Rowland started with a three and ended with a mid-range jumper put the hosts in control at 65-55. Cooper highlighted the Oktyabr response with 5 points in a 0-7 push. Gaffney and Fischer gave Jerusalem a 68-62 lead through three quarters. Guin led a 0-7 Oktyabr run that brought the visitors within 1. After Smith’s layup ended a Jerusalem dry spell, Guinn tied the game at 74-74 with a three-pointer and Zaytsev’s jumper gave Oktyabr its first lead since the opening minutes. Smith scored the next 4 points, but Cooper’s three-pointer made it 78-79 with four minutes remaining. The teams continued to trade big shots; Bar Timor’s three put Jerusalem ahead and Guinn’s response made it 83-84 with two minutes remaining. After a timeout, Gaffney connected from the corner to make it 86-86. Then a Rowland triple made it 89-86 with 22 seconds on the clock. Cooper and Rowland exchanged free throws as a free throw contest began. Janning missed first to open the door for the visitors, but Johnson’s missed a dunk at the buzzer to give Jerusalem the victory. "Sometimes when you have a short roster, everyone knows that they need to give everything. That what the guys did. At this stage, we need to win games. If we can forget last year as quickly as possible, we’ll succeed. There was a lot of pressure because this was an important game. We played against a team that it’s difficult to prepare for. I am glad we won. " 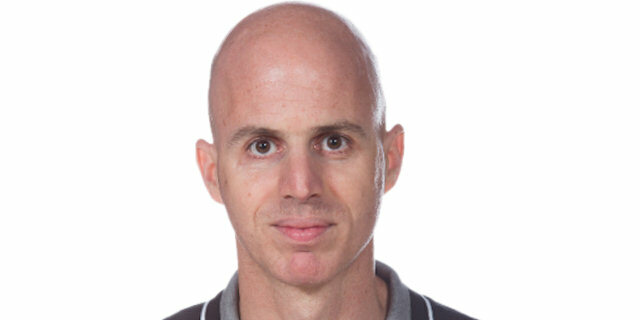 "Congratulations to Hapoel for the victory tonight. It was a good play in the last minute."